White-winged doves (Zenaida asiatica) synchronize their migration into the Sonoran Desert with the reproductive cycle of saguaro cactus (Carnegeia gigantea). Saguaros provide crucial resources for wildlife during the hottest and driest months of the year (prior to the onset of the summer monsoon season). We investigated the dependence of white-winged doves on saguaros in order to predict their habitat requirements along migratory corridors. White-winged doves are saguaro specialists, and they rely on saguaros almost solely for nutrients and water during the breeding season. Breeding white-winged dove distributions broadly overlap saguaro distributions in the Sonoran Desert. 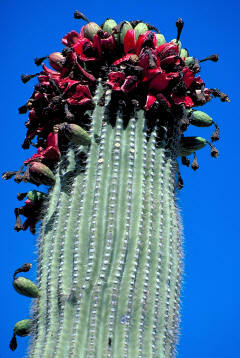 While white-winged doves are important saguaro pollinators, and they are also the main seed predators of saguaros. Thus, saguaros and white-winged doves maintain an asymmetrical ecological interaction. 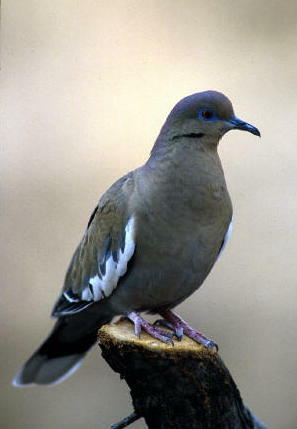 The western white-winged dove (Zenaida asiatica mearnsii) is unique among migratory pollinators because it is also a game species. These doves pollinate saguaro flowers and consume saguaro fruit, and they are also intensely hunted in their breeding range in Sonora and Arizona, and in their wintering range in western Mexico. 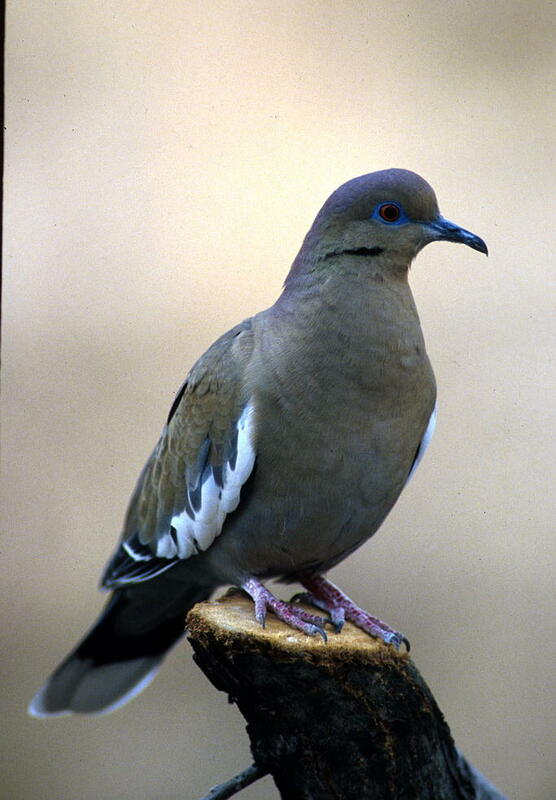 Like other members of their genus, white-winged doves are facultative colonial nesters (Bucher 1992). It is unknown whether they nested colonially before large-scale agriculture. However, by the beginning of the twentieth century several large colonies were well established in the then extensive riparian mesquite bosques along the Santa Cruz and Gila Rivers. The dramatic white-winged dove population fluctuations in Arizona in the last 150 years can be explained largely by changes in human perceptions of doves (as pests, game, or fragile resources) and by how humans have used the land that they share with doves and saguaros (Alcock 1993). Populations of white-winged doves associated with agricultural fields and riparian thickets went through several declines in the last century related to over hunting, destruction of nesting habitat, and reduction in cereal production (O'Connor 1939, Neff 1940, Smith 1983, Brown 1989). The morning feeding flights of white-winged doves that were described by Cottam and Trefethen (1968) as "one of the great natural wonders of Arizona" are a thing of the past. They may have been artificial, existing only with agricultural activities. In the words of John Alcock (1993), "we have played god with the white-winged dove." Our perception of population trends in these doves may be biased due to the almost sole emphasis on the large and highly variable populations of colonially nesting, agriculturally dependent doves. It is not certain that desert dwelling, saguaro dependent white-winged doves followed the same trends. The foraging habits, social behavior, and demography of desert dwelling doves appear to differ from those of birds dependent on agricultural products. The populations of desert dwelling doves have more scattered nests (Arnold 1943, Wigal 1973), are more difficult to hunt, and have received significantly less study. Their population trends in this century are not well understood. White-winged doves in the Sonoran Desert may be unique in that, at least during this last century, a colonially nesting population that fed on cultivated grain coexisted with a solitary nesting population that fed primarily on the fruit and nectar of a single plant species. White-winged doves migrate into the Sonoran Desert to breed during the driest and hottest time of the year. The reason for this may be that the dove's breeding cycle is synchronized with the reproductive cycle of the saguaro (Haughey 1986, Shreve and Wiggins 1964). The ecological dependence of white-winged doves on saguaros (and other columnar cacti farther south in the Sonoran Desert) is recognized in its Sonoran vernacular name, "paloma pitayera," which means "pigeon that eats columnar cactus fruit." White-winged doves are widespread in North and South America, with 12 morphologically distinct allopatric populations (Saunders 1968). But, only western white-winged doves rely extensively on saguaro nectar and fruit. The other 11 populations feed on a variety of seeds and agricultural grains (Cottam and Trefethen 1968). 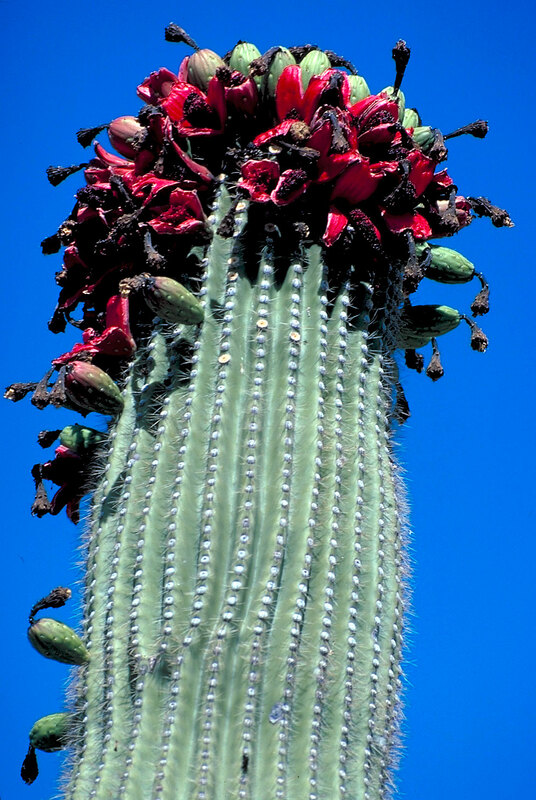 Saguaros produce flowers in the late spring (from late April to mid June in Arizona; Schmidt and Buchmann 1986) and their fruit is ripe from mid June through the end of July (Steenbergh and Lowe 1977). 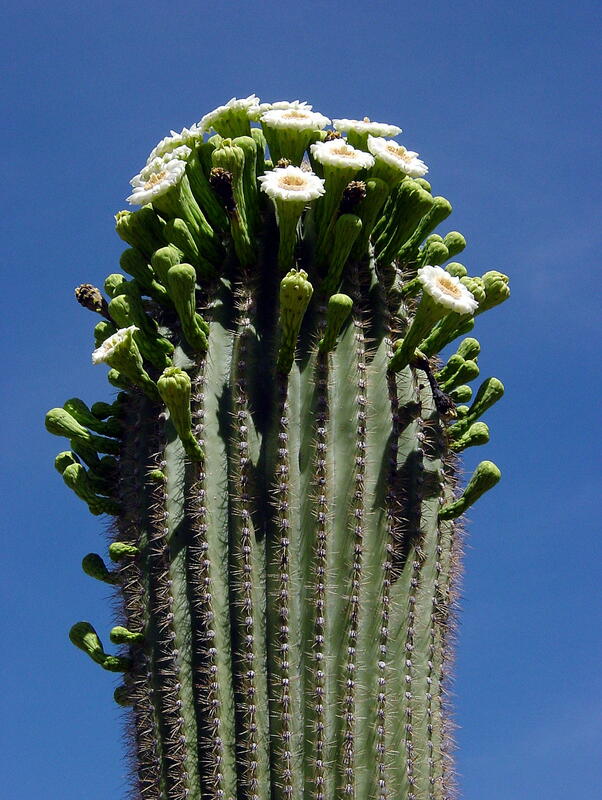 Since saguaro reproduction occurs in the driest and hottest months of the year, their flowers and fruit represents crucial water and nutrient sources for a variety of desert animals (Mart�nez del Rio et al. in press). 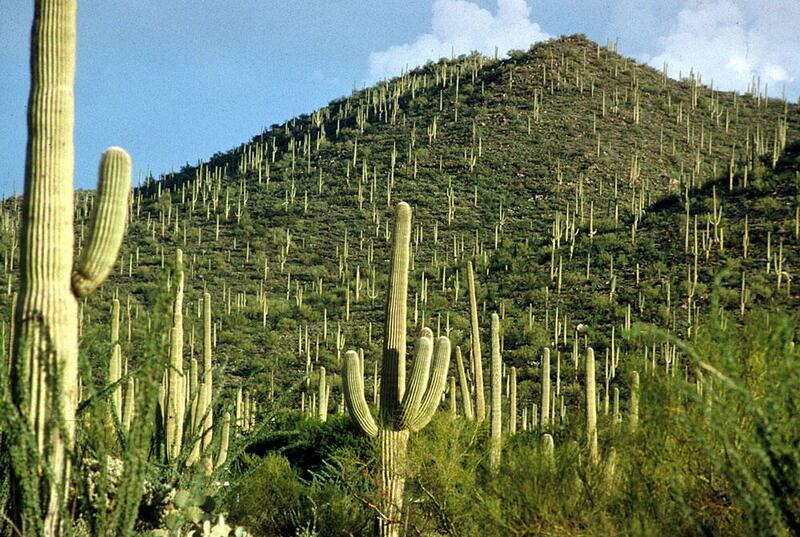 Saguaro reproductive output is relatively independent of precipitation levels. They fruit abundantly every year, but bear more fruit in dry years. Saguaro flowers and fruits are used by almost every member of the Sonoran Desert bird community as well as by several bat and bee species (Alcorn et al. 1959, Haughey 1986, Schmidt and Buchmann 1986, Steenbergh and Lowe 1977). The large number of consumers of saguaro nectar, pollen, and fruit attests to the importance of this plant as a resource for desert animals. Although the identities of these animals have been established (Alcorn et al. 1959, McGregor et al. 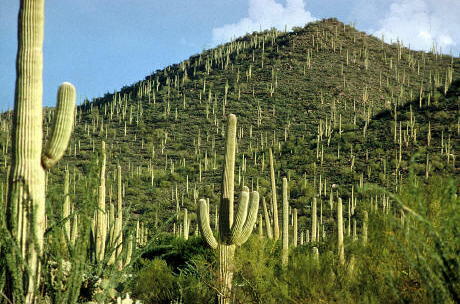 1962, Steenbergh and Lowe 1977), there is little quantitative data on the transfer of water and energy from saguaros into consumer populations. The functional ecological importance (see Hurlbert 1997) of saguaros for Sonoran Desert ecosystems is presumably large, but it has remained unmeasured. 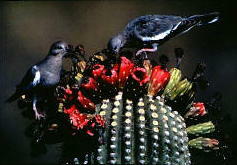 Paloma pitayeras depend heavily on saguaro flowers and fruit. 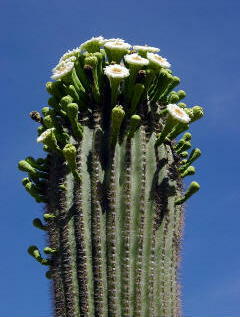 Saguaros are abundant in northern Sonora and southern Arizona. Our goal was to use stable isotope analysis to quantitatively determine the reliance of white-winged doves on saguaros to better understand the habitat requirements of this important migratory pollinator.